On April 19, 2019 the LDS Church announced that the temple will close on December 29, 2019 for renovations that are anticipated to take approximately four years. Salt Lake Temple is the centerpiece of the 10-acre (4.0 ha) Temple Square in Salt Lake City, Utah. 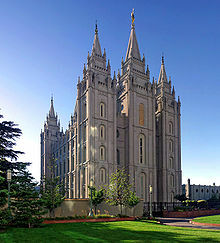 Coordinates: 40°46′14″N 111°53′31″W﻿ / ﻿40.77056°N 111.89194°W﻿ / 40.77056; -111.89194 The Salt Lake Temple is a temple of The Church of Jesus Christ of Latter-day Saints (LDS Church) located on Temple Square in Salt Lake City, Utah, United States. At 253,015 square feet (23,505.9 m2), it is the largest LDS temple by floor area. Dedicated in 1893, it is the sixth temple completed by the church, requiring 40 years to complete, and the fourth temple built since the Mormon exodus from Nauvoo, Illinois, in 1846. The Salt Lake Temple is the centerpiece of the 10-acre (4.0 ha) Temple Square in Salt Lake City, Utah. Like other LDS temples, it is considered sacred by the church and its members and a temple recommend is required to enter, so there are no public tours inside the temple as there are for other adjacent buildings on Temple Square. 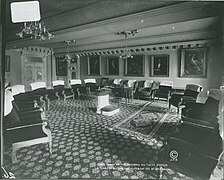 In 1912, the first public photographs of the interior were published in the book The House of the Lord, by James E. Talmage. Since then, various photographs have been published, including by Life magazine in 1938. The temple grounds are open to the public and are a popular tourist attraction. Due to its location at LDS Church headquarters and its historical significance, the Temple is patronized by Latter-day Saints from many parts of the world. The Salt Lake Temple is also the location of the weekly meetings of the First Presidency and the Quorum of the Twelve Apostles. 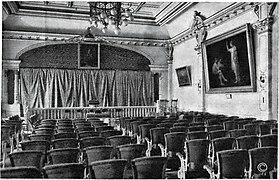 As such, there are special meeting rooms in the building for these purposes, including the Holy of Holies, which are not present in other temples. The temple includes some elements thought to evoke Solomon's Temple at Jerusalem. It is oriented towards Jerusalem and the large basin used as a baptismal font is mounted on the backs of twelve oxen, as was the Molten Sea in Solomon's Temple (see Chronicles 4:2–4). (However, the literal interpretation of the Biblical verses has been disputed.) At the east end of the building, the height of the center pinnacle to the base of the angel Moroni is 210 feet, or 120 cubits, making this Temple 20 cubits taller than the Temple of Solomon. The temple is located in downtown Salt Lake City, with several mountain peaks close by. Nearby, a shallow stream, City Creek, splits and flows both to the west and to the south, flowing into the Jordan River. There is a wall around the 10-acre (4.0 ha) temple site. The surrounding wall became the first permanent structure on what has become known as Temple Square. The wall is a uniform 15 feet high but varies in appearance because of the southwest slope of the site. The location for the temple was first marked by LDS prophet Brigham Young, the second president of the church, on July 28, 1847, just four days after arriving in the Salt Lake Valley. In 1901 the apostle Anthon H. Lund recorded in his journal that "it is said" that Oliver Cowdery's divining rod was used to locate the temple site. The temple site was dedicated on February 14, 1853 by Heber C. Kimball. Groundbreaking ceremonies were presided over by Young, who laid the cornerstone on April 6 of that year. The architect was Truman O. Angell, and the temple features both Gothic and Romanesque elements. Sandstone was originally used for the foundation. During the Utah War, the foundation was buried and the lot made to look like a plowed field to prevent unwanted attention from federal troops. After tensions had eased in 1858 and work on the temple resumed, it was discovered that many of the foundation stones had cracked, making them unsuitable for use. Although not all of the sandstone was replaced, the inadequate sandstone was replaced. The walls are quartz monzonite (which has the appearance of granite) from Little Cottonwood Canyon, located twenty miles (32 km) southeast of the temple site. Oxen transported the quarried rock initially, but as the Transcontinental Railroad neared completion in 1869 the remaining stones were carried by rail at a much faster rate. 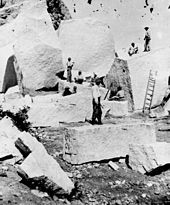 The capstone—the granite sphere that holds the statue of the Angel Moroni—was laid on April 6, 1892, by means of an electric motor and switch operated by Wilford Woodruff, the church's fourth president, thus completing work on the temple's exterior. The Angel Moroni statue, standing 12.5 feet (3.8 m) tall, was placed on top of the capstone later the same day. At the capstone ceremony it was proposed by Woodruff that the interior of the building be finished within one year, thus allowing the temple to be dedicated forty years to the day of its commencement. John R. Winder was instrumental in overseeing the completion of the interior on schedule; he would serve as a member of the temple presidency until his death in 1910. Woodruff dedicated the temple on April 6, 1893, exactly forty years after the cornerstone was laid. 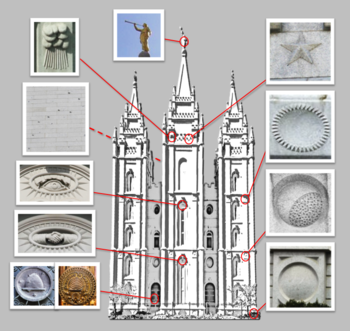 Infographic of the locations and details of some Salt Lake Temple exterior symbols. Original 1854 design of the East side showing the horizontal angel, Sun faces, earth details, and compass and square window details. These elements were later modified or removed. Angel Statue – The golden Angel Moroni statue, by sculptor Cyrus E. Dallin, tops the capstone of the temple. It symbolizes the angel mentioned in Revelation 14:6 that will come to welcome in the Second Coming of Christ. 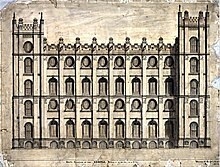 Early architectural plans showed two horizontally flying angels and the earliest references to the Salt Lake Temple's angel were always Gabriel. The original blueprint drawings intended the angel to be wearing temple ceremonial clothing like the angel on the Nauvoo temple, but Paris-trained sculptor Dallin's 12.5-foot statue wears a crown instead of a temple cap that included a bright light which created a halo effect at night. Big Dipper – On the west side of the temple the Big Dipper appears, which represents how the priesthood can help people find their way to heaven as the constellation helped travelers find the North Star. :42 The uppermost stars on the temple's constellation align with the actual North Star. An original 1854 elevation plan showing the saturn stones, earth stone detail, Sun faces, and square and compass window accents. These elements were later discarded. Spires – The six spires of the temple represent the power of the priesthood. The three spires on the east side are a little higher than those on the west: they represent the Melchizedek, or "higher priesthood", and the Aaronic, or "preparatory priesthood" respectively. The three spires on the east side represent the church's First Presidency and the twelve smaller spires on those three represent the Twelve Apostles. The temple has been damaged by two separate bombing incidents. 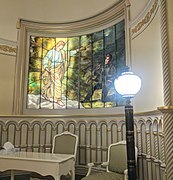 The first was indirect damage from a bomb on April 10, 1910 at the nearby Hotel Utah (now the Joseph Smith Memorial Building). This damaged the trumpet of the Moroni statue atop the temple. The second was on November 14, 1962, when at about 1:30 AM, the southeast door of the Salt Lake Temple was bombed. FBI agents state that the explosive had been wrapped around the door handles on the southeast entrance of the temple. The large wooden entrance doors were damaged by flying fragments of metal and glass. Damage to interior walls occurred 25 feet inside the temple, but damage to the interior was minor. Eleven exterior windows were shattered. 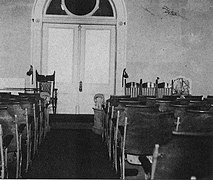 Some members of the LDS Church believed the incident was related to violence surrounding the Civil Rights Movement, the nation's racial strife, and the church's priesthood restriction, based on race, in effect at the time. 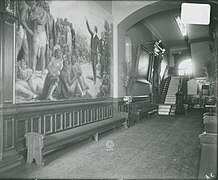 Wikimedia Commons has media related to Salt Lake Temple (interior). Wikimedia Commons has media related to Salt Lake Temple. ^ "Temple Square". Utah.com (Utah Office of Tourism). Retrieved October 11, 2012. ^ Hamblin, William J.; Seely, David Rolph (2007). Solomon's Temple: Myth and History. Thames & Hudson. pp. 191–193. ISBN 9780500251331. ^ "Salt Lake Temple". ldschurchnewsarchive.com. Retrieved October 11, 2012. ^ Walker, Joseph (March 23, 2012). "It's official: the Provo City Center Temple". Deseret News. Retrieved August 10, 2013. ^ Talbot, Bridger (2014). "The Evolution of Sacred Space: The Changing Environment of the Endowment". Front Matter: 2014 BYU Religious Education Student Symposium. Retrieved July 9, 2017. ^ Mangus, Brittany (January 8, 2013). Prepare Now for the Temple: An Essential Guide for Young Adult Sisters (Reprint ed.). Springville, Utah: Cedar Fort Inc. p. 1996. ISBN 1599550520. Retrieved July 9, 2017. ^ Wright, Kristine; Stapley, Jonathan (Winter 2011). "Female Ritual Healing in Mormonism". Journal of Mormon History. 37 (1). ^ a b Stapley, Jonathan A.; Wright, Kristene L. (Fall 2008). 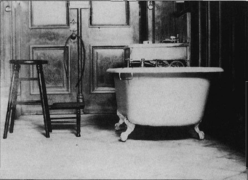 ""They Shall Be Made Whole": A History of Baptism for Health". Journal of Mormon History. 34 (4). ^ Buerger, David John (Spring 1983). "'The Fullness of the Priesthood': The Second Anointing in Latter-day Saint Theology and Practice" (PDF). Dialogue: A Journal of Mormon Thought. 16 (1): 41, 43. Retrieved July 10, 2017. ^ a b c Talmage, James (1912). The House of the Lord: A Study of Holy Sanctuaries Modern and Ancient. Salt Lake City: Deseret News. Retrieved July 9, 2017. ^ a b Walgreen, Kent (Fall 1996). "Inside the Salt Lake Temple: Gisbert Bossard's 1911 Photographs" (PDF). Dialogue: A Journal of Mormon Thought. 29 (3). Retrieved July 8, 2017. ^ a b c Hanks, Marion D. "Salt Lake Temple". LDS FAQ. BYU Studies. Archived from the original on October 21, 2013. Retrieved October 11, 2012. ^ Homer, Michael W. (Fall 1994). "'Similarity of Priesthood in Masonry': The Relationship Between Freemasonry and Mormonism" (PDF). Dialogue: A Journal of Mormon Thought. 27 (3). Retrieved July 8, 2017. ^ a b c d e f g h i j Roberts, Allen D. (May 1985). "Where Are the All-Seeing Eyes? The Origin, Use, and Decline of Early Mormon Symbolism" (PDF). Sunstone Magazine. 1 (49). Retrieved June 25, 2017. ^ Berber, Allen H. (April 4, 2006). Celestial Symbols: Symbolism in Doctrine, Religious Traditions and Temple Architecture. Horizon Publishers. ISBN 0882908081. Retrieved July 10, 2017. 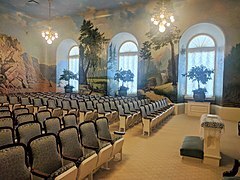 ^ "Oldest Artwork on Temple Square". Temple Square Blog. LDS Church Deseret Management Corporation. Retrieved July 8, 2017. ^ "Salt Lake Temple p.47". collections.lib.utah.edu. University of Utah. Retrieved July 8, 2017. ^ Bishop, M. Guy; Holzapfel, Richard Neitzel (Spring 1993). "The 'St. Peter's of the New World': The Salt Lake Temple, Tourism, and a New Image for Utah" (PDF). Utah Historical Quarterly. 61: 33. Retrieved July 8, 2017. Page 33 archived here. ^ Gaskill, Alonzo L. (August 9, 2016). Temple Reflections: Insights into the House of the Lord. Cedar Fort Inc. pp. 193–194. ISBN 1462118992. Retrieved September 6, 2017. ^ Oman, Richard G. "Beehive Symbol". BYU Harold B. Lee Library. Brigham Young University. Retrieved June 25, 2017. ^ a b Lyon, Jack (December 5, 2016). Understanding Temple Symbols: Themes of the Temple in Scripture, History, and Art. Deseret Book Company. ISBN 1629722448. ^ Zimmerman, Dean R. (June 1978). "The Salt Lake Temple". The New Era. Retrieved July 10, 2017. ^ Holzapfel, Richard Neitzel (November 1993). "Every Window, Every Spire Speaks of the Things of God". Liahona. Retrieved July 10, 2017. ^ Andrew, Laurel B. (June 1978). The Early Temples of the Mormons: The Architecture of the Millennial Kingdom in the American West (1st ed.). State University of New York Printing. pp. 84–85. ISBN 0873953584. Retrieved June 25, 2017. ^ Kirby, Robert (March 10, 2017). "Kirby's disturbing history: Close encounters of the bizarre kind at Mormonism's Temple Square". The Salt Lake Tribune. In April 1910, Moroni's trumpet was knocked awry by a bomb set at the construction site of the Hotel Utah across the street. The bomb, which involved a labor dispute, shattered windows blocks away. Moroni's trumpet wasn't fixed until two months later, when the church paid a couple of steeplejacks $125 to climb the spire and reposition it. ^ a b c d "Blast Mormon Temple with Plastic Bomb". Chicago Daily Tribune. November 15, 1962. Retrieved January 19, 2015. ^ a b Johnson, Jeffrey O. (June 1994). "Change and Growth: The Mormon Church & the 1960sHE 1960" (PDF). Sunstone. Retrieved January 19, 2015. ^ "Salt Lake Temple Tornado Wedding". Final Touch Film & Video Production. August 11, 1999. Retrieved October 10, 2018. ^ a b Wadsworth, Nelson B. (September 1992). Set in Stone, Fixed in Glass. Salt Lake City: Signature Books. ISBN 1560850248. Retrieved July 8, 2017. Hamilton, Mark (1992). The Salt Lake Temple: A Monument to a People. Salt Lake City, Utah: University Services. ISBN 0-913535-07-9. OCLC 28119583. Hamilton, Charles Mark (1979). 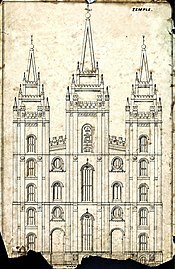 The Salt Lake Temple: an architectural monograph (Ph. D. thesis). Ohio State University. OCLC 5925170.